Technology has become critical to marketing success. But most marketers are not technologists by trade — they’re creatives, strategists and relationship builders. Simply put, technology does not come natural to them. So for our latest article, we asked the MarketingSherpa audience about their biggest technology innovation challenges. Read on to see which challenges loomed the largest, along with advice from your peers about how to overcome these challenges. 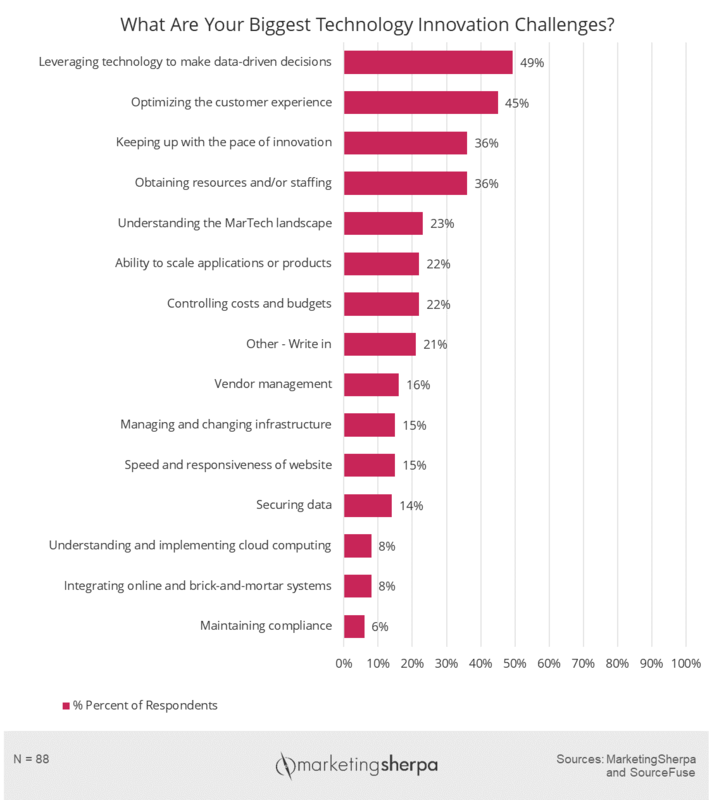 We recently asked marketers: What are your biggest technology innovation challenges? For an avid follower of marketing trends, the results should not be shocking. Not only did data loom large, but customer experience did as well. The top response was “leveraging technology to make data-driven decisions” chosen by half (49%) of respondents. A close second was “optimizing the customer experience” chosen by 45% of respondents. At this sample size, we can’t confidently say which of those challenges is more pressing, but they were both of greater concern than every other topic asked about. With all of the heated industry press about topics like GDPR (Europe’s General Data Protection Regulation), one would think that compliance would be a hotter topic. Nevertheless, at the bottom of the list was maintaining compliance, chosen by only 6% of respondents. Either that means compliance is easy for marketers or it’s just not as pressing as doing the tasks necessary to drive results. “It’s exciting to see the growth of marketers from a data and engineering perspective. We are already seeing marketers be more involved in our innovation, development, and strategic engagements. It’s this type of thinking that is developing new skill-sets and paving the way for new processes and products,” said Andy Bryant, Director, Growth Marketing, SourceFuse (sponsor of the survey). In the survey, we also asked what advice respondents would give to marketers based on their own struggles and triumphs. Here are some of the top takeaways from your peers. “Most of us in business should follow innovation in technology for sure. But it's easy to become overwhelmed into inaction, or seduced by the shiny object. We each need to figure out a cadence for checking in with ourselves,” advised Kristin Lennarz, Clinical Assistant Professor, Digital Marketing Strategy, University of Rochester Simon School of Business. Are we underserved by our current technology to the extent it will impact our business objectives? Are we outmoded versus our competition such that we will lose competitive advantage? Most importantly, are we outdated to the extent we will not deliver/overdeliver against the expected or intended customer experience? And don’t necessarily expect instant results. “Be prepared for a long haul — don't expect to get rich quickly,” said Joel Diemer, Owner, Motorwest Rt66. While leveraging technology to make data-driven decisions was the top response, remember that humans actually make those decisions. “There is data everywhere — it’s not the amount of data we can get — it's the proper assessment of that data that will drive results,” said Mark Kithcart, VP Sales and Marketing. And humans (marketers) are making those decisions about other humans (customers). It’s all too easy to reduce customers down to a set of numbers or attributes and de-humanize them. “According to estimates last year from IBM, we are creating 2.5 quintillion bytes of data every single day. Despite the best efforts of algorithms and artificial intelligence, the result is that there is simply too much data to extrapolate meaningful, actionable insights from. The customer's voice has become lost in the data. To get a real, human understanding of their audiences, an additive approach should be taken by marketers. Combining insights from big data with the human feedback delivered by small data — meaningful pieces of information that drive intelligent decision-making, a brand's data can be humanized, keeping the customer's voice in the room,” advised Zlatko Vucetic, CEO of FocusVision. For innovative technology implementations to succeed, ensure you have the right human infrastructure in place. “Get a marketing operations function in place, assign owners to vendor management, MarTech stack architecture, and data management, and create a center of excellence for operating and administering the technology as a service,” said Kevin Joyce, CMO, The Pedowitz Group. As I mentioned above, technology does not come natural to every marketer. And marketers don’t necessarily have to become technologists. There are experts who can help. “Marketers should learn the language some, but don't feel like you have to know everything about tech in order to effectively manage innovation in your day-to-day. There are many professionals who are ready to help do the heavy lifting. Just stay informed,” said Curtis Kitchen, Director of Communications, National Auctioneers Association. That expert advice can involve technical implementation, but it can involve strategic implementation as well. “Define your key objectives first. Derive your data strategy from those key objectives. Get expert advice on ‘how’ you can translate your data into ROI,” said Anubhav Yadav, Digital Marketing Consultant. And don’t overlook peer feedback. “Getting through the marketing hype and into real feedback from real users can make the evaluation process much more meaningful. In fact, 92 percent of B2B buyers are more likely to make a purchase after reading a trusted review,” said Michael Fauscette, chief research officer, G2 Crowd. You can get that advice from third parties, but you can also ask the vendor directly. They should be able to connect you with people and stories that explain the use of their product. “You need to know if what they say they can do is what they can actually deliver. Multiple customer case studies should be available to prove the vendor's solution. Talking to the vendor's customers directly — especially if you already know someone at that organization — is critical,” said Michael Osborne, President & CEO, SmarterHQ. Even beyond customer experience-specific technology, all tech should ultimately help the customer. 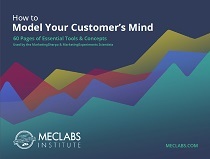 Analytics help you better determine what the customer wants. Compliance solutions essentially make sure you handle the customer data and interactions with care. If there’s one big lesson we teach in all of our content, it is that. Make all decisions — including tech — first with the customer in mind. “There are many, many vendors available to use in your marketing toolbox. If you make decisions on who to work with based on what you learn through MECLABS [MarketingSherpa’s parent research organization] you will be far ahead of and reduce the chances of failure,” said Scot Wallace of Morgan Murphy Media.